Members of the 2018 All-Over the Mountain baseball team include, first row, from left: Colton Ledbetter, Spain Park; Malcom Russell, John Carroll; Chris Dugas, Vestavia; Andrew Knight, Vestavia; and Colton Lewis, Vestavia Hills. Second row: Sam Dozier, Spain Park; Parker Scott, Briarwood; Carson Eddy, Briarwood; Ben Teel, Homewood; and Josh Hall, Homewood. Third row: Coach Lee Hall, Homewood; Peyton Wilson, Hoover; Scott Elgin, Hoover; Griffin Lape, Hoover; Preston Moore, Hoover; and John Marks, Mountain Brook. Fourth row: Sonny DiChiara, Hoover; Gene Hurst, Oak Mountain; Clay Stearns, Mountain Brook; Aaron Shiflet, Mountain Brook; and Colton Yeager, Mountain Brook. Not pictured: Wesley Helms, Hudson Hartsfield, Briarwood; Nolan Hammonds, Hoover; Caleb Ragland, Jackson Kimbrell and Lando Cato, Oak Mountain. Journal photos by Marvin Gentry. A year ago, Lee Hall had his doubts about accepting the Homewood baseball coaching job. It wasn’t because he didn’t think it was a good opportunity, but because of his son Josh. Lee Hall had been the head coach at Randolph High in Huntsville and Josh had been a standout center fielder on the team for three seasons. “I had my reservations about uprooting him for his senior year,” coach Hall said. Hall, who formerly coached at Briarwood Christian, eventually decided it was a worthwhile move, and Josh’s one season at Homewood turned out magnificently. They younger Hall broke two state records and a national record this spring. He broke the Alabama High School Athletic Association single-season stolen base record with 82 (in 84 attempts), eclipsing his own record of 81, set in 2016. He broke the AHSAA career record with 224 steals, shattering the old record of 164 set by Slocumb’s Scottie Burdeshaw from 2005-10. And, finally, he broke the national record of 211 steals that previously was held by Haddon McIntosh of Norman Community School in Oklahoma, who played from 2013-2016. “It’s pretty cool,” Josh Hall said of owning the national record. The 5-foot-9, 175-pound lefty swinging Hall hit .500 (57 of 114) with four home runs and 26 RBIs from the lead-off spot. He had an on-base percentage of .613 with 30 walks and only 12 strikeouts. He also put together a 24-game hitting streak, and in 40 games he was hitless in only three games. 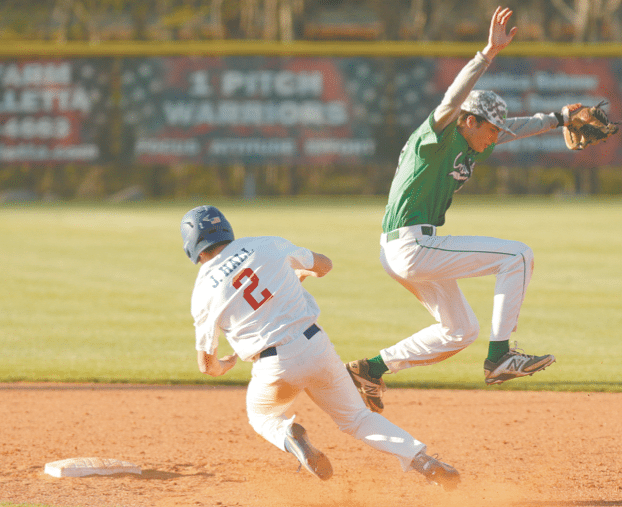 Hall, who will play college baseball at Ole Miss, helped lead Homewood to the most regular season wins, 25, and the most overall wins, 29, in school history. For his marvelous season, Hall is the Over the Mountain Journal’s Co-Player of the Year, along with Hoover’s Sonny DiChiara. Lee Hall is the OTMJ Coach of the Year. Josh Hall described the move to Homewood in similar terms. Josh Hall embraced the challenge of performing at a bigger school, jumping from Class 4A at Randolph in 2017 to Class 6A Homewood. His dad didn’t expect the Patriots to have the kind of season they had, either, reaching the Class 6A quarterfinals before being eliminated by perennial power Cullman. “When we came in, looking at the numbers, I knew they had had a good season the year before,” Lee Hall said. “But we had only 13 innings coming back on the mound and just 8 percent of the offense. When you looked at it on paper, you could say we had a long way to go. But I knew we were going into it with 12 seniors, who sold out and bought into everything we were doing and made it a fun season. He said being named the OTMJ Coach of the Year was a blessing. Josh Hall had a similar response. “With this being my last year, to share this honor with him is pretty special,” he said.